Wie reagieren aquatische Organismen auf Stress? Unser Ziel ist es, die Effekte von Chemikalien auf die aquatische Umwelt zu erkennen und zu verstehen. Im Vordergrund stehen die mechanistischen Zusammenhänge von Chemikalienwirkungen allein, aber auch in Mischung mit anderen Chemikalien oder Stressoren, wie zum Beispiel UV Strahlung. Die fünfte CHanalysis, mit Marc Suter als Hauptorganisator, war ein grosser Erfolg. Höhepunkte waren Präsentationen zu Proteinfunktionen und Single Cell Transkriptomics. Danke Marc für Deinen grossen Einsatz! Die Organisation 500 Women Scientists lud am 8. 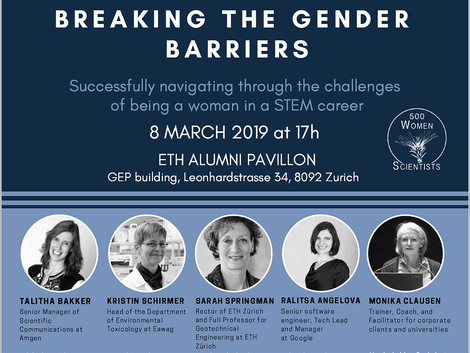 März Doktorandinnen und Postdoktorandinnen ein zur Veranstaltung Breaking the gender barriers - Successfully navigating through the challenges of being a woman in a STEM career. Als eine der fünf eingeladenen Referentinnen verriet Kristin, was sie von "ihrem" Baum gelernt hat. Kristin's Vortrag kann HIER angeschaut werden. Neonicotinoids are widely used insecticides that have frequently been found in freshwater with concentrations ranging from ng to μg/L. It is known that these compounds impact non-target invertebrates, such as bees and gammaridae, in terms of toxicity and behavior, but impacts and species differences on vertebrates such as fish are little explored. The aim of this study was to investigate and compare the effects of one widely used neonicotinoid, imidacloprid, on development and behavior of two fish model species: Zebrafish (Danio rerio) and Japanese medaka (Oryzias latipes). Fish were exposed for 5 (zebrafish) and 14 (medaka) days from 0.2 to 2000 μg/L imidacloprid by aqueous exposure. Survival, development, behavior and histological features were monitored and organism-internal concentrations and biotransformation products measured. Imidacloprid caused sublethal effects in both species but the effects were much stronger in medaka with deformities, lesions and reduced growth being the most prominent impacts. Due to the overall longer time of development, time-integrated exposure of medaka was about 2-fold higher compared to zebrafish, potentially accounting for parts of the sensitivity differences. Our results underline the importance of taking species sensitivity differences into account especially when considering that medaka responded at imidacloprid concentrations that have been measured in the environment. The fish intestine comprises an important environment-organism interface that is vital to fish growth, health and pathogen defense. Yet, knowledge about the physiology and defense mechanisms toward environmental stressors, such as bacterial or viral cues, is limited and depends largely on in vivo experiments with fish. On this background, we here explore the immune competence of a recently established in vitro intestinal barrier model based on the rainbow trout (Oncorhynchus mykiss) intestinal epithelial cell line, RTgutGC. We demonstrate that the RTgutGC cell barrier reacts to two immune stimuli, the bacterial lipopolysaccharide (LPS) from Escherichia coli and the viral Poly(I:C), by regulating the mRNA abundance of selected genes in a partly time- and concentration dependent manner. The immune stimuli activated the Myd88-and Ticam-dependent signalling cascades, which resulted in downstream activation of pro-inflammatory cytokines and interferon, comparable to the regulatory patterns known from in vivo. Stimuli exposure furthermore influenced the regulation of epithelial barrier markers and resulted in slightly impaired barrier functionality after long-term exposure to LPS. Collectively, we provide proof of the usefulness of this unique cell culture model to further gain basic understanding of the fish innate immune system and to apply it in various fields, such as fish feed development and fish health in aquaculture or the evaluation of immuno-toxicity of chemical contaminants. Aerobic methane-oxidizing bacteria (MOB) substantially reduce methane fluxes from freshwater sediments to the atmosphere. Their metalloenzyme methane monooxygenase (MMO) catalyses the first oxidation step converting methane to methanol. Its most prevalent form is the copper-dependent particulate pMMO, however, some MOB are also able to express the iron-containing, soluble sMMO under conditions of copper scarcity. So far, the link between copper availability in different forms and biological methane consumption in freshwater systems is poorly understood. Here, we present high-resolution profiles of MOB abundance and pMMO and sMMO functional genes in relation to copper, methane and oxygen profiles across the oxic-anoxic boundary of a stratified lake. We show that even at low nanomolar copper concentrations, MOB species containing the gene for pMMO expression are present at high abundance. The findings highlight the importance of copper as a micronutrient for MOB species and the potential usage of copper acquisition strategies, even under conditions of abundant iron, and shed light on the spatial distribution of these microorganisms. The objective of this study was to evaluate the suitability of the rainbow troutintestinal epithelial cell line (RTgutGC) as an in vitro model for studies of gut immunefunction and effects of functional feed ingredients. Effects of lipopolysaccharide(LPS) and three functional feed ingredients [nucleotides, mannanoligosaccharides(MOS), and beta-glucans] were evaluated in RTgutGC cells grown on conventionalculture plates and transwell membranes. Permeation of fluorescently-labeled albumin,transepithelial electrical resistance (TEER), and tight junction protein expressionconfirmed the barrier function of the cells. Brush border membrane enzyme activities[leucine aminopeptidase (LAP) and maltase] were detected in the RTgutGC cellsbut activity levels were not modulated by any of the exposures. Immune relatedgenes were expressed at comparable relative basal levels as these in rainbow troutdistal intestine. LPS produced markedly elevated gene expression levels of the proinflammatorycytokines il1b, il6, il8, and tnfa but had no effect on ROS production.Immunostaining demonstrated increased F-actin contents after LPS exposure. Amongthe functional feed ingredients, MOS seemed to be the most potent modulatorof RTgutGC immune and barrier function. MOS significantly increased albuminpermeation and il1b, il6, il8, tnfa, and tgfb expression, but suppressed ROS production,cell proliferation and myd88 expression. Induced levels of il1b and il8 were alsoobserved after treatment with nucleotides and beta-glucans. For barrier functionrelated genes, all treatments up-regulated the expression of cldn3 and suppressedcdh1 levels. Beta-glucans increased TEER levels and F-actin content. 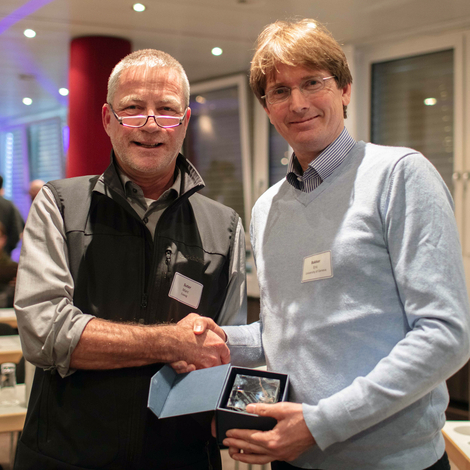 Collectively, thepresent study has provided new information on how functional ingredients commonlyapplied in aquafeeds can affect intestinal epithelial function in fish. Our findingssuggest that RTgutGC cells possess characteristic features of functional intestinalepithelial cells indicating a potential for use as an efficient in vitro model to evaluate effectsof bioactive feed ingredients on gut immune and barrier functions and their underlyingcellular mechanisms. Nanomaterial risk governance requires models to estimate the material flow, fate and transport as well as uptake/bioavailability, hazard and risk in the environment. This study assesses the fit of such available models to different stages during the innovation of nano-enabled products. Through stakeholder consultations, criteria were identified for each innovation stage from idea conception to market launch and monitoring. In total, 38 models were scored against 41 criteria concerning model features, applicability, resource demands and outcome parameters. A scoring scheme was developed to determine how the models fit the criteria of each innovation stage. For each model, the individual criteria scores were added, yielding an overall fit score to each innovation stage. Three criteria were critical to stakeholders and incorporated as multipliers in the scoring scheme; the required time/costs and level of expertise needed to use the model, and for risk assessment models only, the option to compare PEC and PNEC. Regulatory compliance was also identified as critical, but could not be incorporated, as a nanomaterial risk assessment framework has yet to be developed and adopted by legislators. In conclusion, the scoring approach underlined similar scoring profiles across stages within model categories. As most models are research tools designed for use by experts, their score generally increased for later stages where most resources and expertise are committed. In contrast, stakeholders need relatively simple models to identify potential hazards and risk management measures at early product development stages to ensure safe use of nanomaterials without costs and resource needs hindering innovation.